← Baltimore Orioles, Camden Yards & Crabcakes! The Umpire…….toughest job in baseball! “I couldn’t see well enough to play when I was a boy, so they gave me a special job – they made me an umpire.” President of the United States, Harry S. Truman. As a player I probably would have said the toughest position in baseball is catcher. I wasn’t particularly afraid of the ball, but when you’ve been beaned a couple times and missed a ball that was impossible to catch anyhow and the other team scores, you realize even when things are going right, they can still go really, really wrong. But looking at this as a spectator the toughest job has to be, without a doubt, the lowly umpire. My first exposure to this was at age 10 watching my dad at at my brother’s games giving the ump the going-over, beer in hand, standing up yelling obscenities and setting a stellar example for a couple of kids learning by example. Totally mortifying! So years later when I became the parent in the stands cheering my heart out in support of my little darlings at T-Ball I was very cognizant of these memories. Imagine my shock and humiliation when I was thrown out of a T-Ball game for, you guessed it, yelling at the umpire! The embarrassment is still with me. So all of these memories came flooding back as I watched last night’s replay of the Cleveland/Detroit infamous tag at first. The missed call denied the young pitcher the rarest of rare “perfect game”. This mornings sports headlines would have been all about Ken Griffey Jr’s retirement had this incident not occurred. Well maybe not. A perfect game for sure demands a certain amount of headlines. But no matter. History has been made and it won’t be changed. I feel for the Tiger fans. And I hope the Commissioner’s going to step in and make things right. And he should. It’s the right thing to do. But please, please don’t bring in the instant replay. For crying out loud this is baseball! What really strikes me about this scenario is the candid manner in which the umpire immediately spoke up about the matter on seeing the replay. But then, what else could he have done? (Now’s the time we probably should give this guy a name. He has, after all been a major league umpire for 22 years without any, well, almost any, controversy). But I don’t want to talk about the umpire, or the kid who threw the unrealized perfect game. or instant replay. This story’s about the DETROIT TIGER FANS. What would baseball, or any sport for that matter, be without the fans? Today when the same players, same umpire(s) and the same fans sat for another round of Cleveland/Detroit baseball, the umpire Jim Joyce was introduced among a smattering of boos, it’s expected, always happens, not a surprise. But what was a surprise was the standing ovation and cheers that went up for this guy. I’m emotional just writing about it. And so was he. He had to wear sunglasses to hide the tears for a press conference later. I’ll bet Jim Joyce didn’t get two hours sleep last night. As much as we love to razz the umps, they have the reputation of being the most honest trustworthy bunch of guys (a little nearsighted at times) but never ever do we believe they make a bad call “on purpose”. And for all those split second “how did they do it?” johnny-on-the spot calls, they get no special recognition. It’s their job and they love it and they do it better than anyone. Detroit Tiger fans know this. They know the umpire has the toughest job in baseball so they cut him a little slack and on they go to the next game. That’s what’s so great about baseball. The Detroit Tiger fans. A real Class Act…….representing the best of baseball. 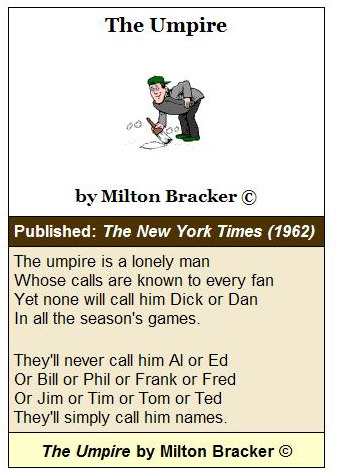 “….The toughest call an Umpire has to make…. It’s having to throw a guy out of the game after you blew the hell out of the play.” American League Umpire Bill Kinnamon. This entry was posted in A1 Baseball, General, Detroit Tigers and tagged BASEBALL, DETROIT TIGER FANS, DETROIT TIGERS, GARLIC FRIES, GARLICFFRIESANDBASEBALL, JIM JOYCE, MILTON BRACKER, THE UMPIRE. Bookmark the permalink. Good case for instant replay!!! Good case for instant replay!!! !